These creatives have dark, gruesome and horrifying nailed. Horror and gothic art won't lose its appeal as long as society maintains its fascination with death. For some artists, the macabre provides a release from internalised fear. For others, it's a playful way to seek a reaction from their viewers. Whatever the motive, managing to capture a truly frightening scene, and present the viewer with a disturbing yet beautiful image, is a real skill. In honour of Halloween, we take a look at great contemporary artists who focus on dark fantasy themes, with many revealing why they paint such deadly themes. If you haven't heard of Keith Thompson, you have almost certainly been privy to some of his inner artistic workings, bringing to life some of the most revered film director's characters (including Guillermo Del Toro) and injecting his creativity into video games and book projects. A concept artist, creature designer and illustrator, Thompson has worked on projects such as 2017 horror flick The Ritual, to create the movie's 'big bad'. He's also worked on Scott Westerfeld's Leviathan book series. Thompson's work focuses on characterisation and that is what makes his art so terrifyingly good. His characters are believable, and could be injected into any good work of horror fiction. You might recognise Fischer's intricate artwork from his years spent illustrating for the Buffy the Vampire Slayer graphic novel covers, and their various spin-offs. His process is no less than artistic alchemy, each image meticulously layered full of glorious detail and lyrical line work – it's a treat to watch, and he generously allows his fans to witness it through videos on his YouTube channel. Fischer uses a unique variety of techniques, including painting on copper. Of course, not all of his work is horror, but all maintain a distinctly eerie, yet romantic feel to them – perhaps an unwitting insight into the artist's own delights and his gravitation towards all things fantastical. "I am a fan of all things fantasy and much of horror falls into this. 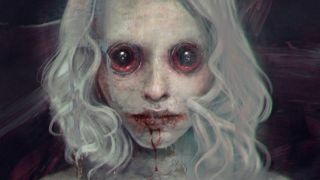 It's the dark side of fantasy with many monsters, characters and fantasy situations," reveals illustrator Anne Stokes. "I love the style of the gothic architecture with its soaring, sweeping shapes and detailed carvings. Dark and deathly imagery offer great scope for artists and the possibility of suggesting a sinister story in the picture. I like the possibilities for contrasting softer and darker subjects." "I have always enjoyed the creativity and look of gothic clothing and enjoyed visiting the Whitby Goth weekends," Stokes continues. "Many people who attend make a great effort to dress up for the occasion which provides an interesting spectacle as the picturesque old town gets taken over by Goths." Pyromallis is the co-founder of Viral Graphics, a music-related artwork collaborative set up back in 2006 with fellow artist and music aficionado, Konstantinos Psichas. Under this name, they have provided some stand-out poster art for bands like Soundgarden, the Melvins and Swans. Pyromallis explains that he is "influenced by the plague of culture, horror films/comics, the metal of death, monsters, the hidden paths of the mind, human stupidity and fear." He practices what he calls "analogue illustration" – traditional techniques using ink, brushes and paper. He seeks to add his "own ideas and manifestations into the ever-boiling Cauldron of Depravity", and his illustrations certainly don't stray away from this macabre manifesto. French illustrator Olivier (or DZO, as he's also known) wishes to go deeper into his exploration of the "noosphere" (a philosophical concept about human thought) with his art. Conjuring up the aesthetics of old etchings and religious engravings, occult manuscripts that flirt with alchemy, witchcraft and blasphemy, the artist creates intricate drawings dull of enigmatic detail. Mixing sensuality, darkness and mythology, he strives to create pieces that are disturbing, haunting and stimulating, oozing with mystery and fascination. Wes Benscoter is a master of metal music album artwork. His terrifying visual skills have been enlisted by pretty much every self-respecting death metal band, including Cattle Decapitation, Morticia, Kreator and Autopsy, not to mention thrashers Slayer, and heavy metal masters Black Sabbath. It takes a seriously strong stomach to take on the challenge of lending your hand in illustrating merch for such brutal acts – one that many an artist would understandably find a little hard to handle. Benscoter never fails to deliver, no matter how gruesome and gory. He'll happily intricately etch a corpse's entrails or set up a more subtly sinister scene. "I’m not really a 'horror' artist as such, but the 'Gothic' is an aesthetic that has always resonated with me, from music, fashion, literature and of course visual art. Confronting the shadows is the best way to come to terms with them," says artist Aly Fell. "That 'long night' is waiting for us all, pretending it doesn't exist is to kid yourself. My fluffy bunnies have teeth, but 'Death' looks good in a tutu." Illustrator Michael Whelan is one of the most important science fiction illustrators of our time, having been the first living artist inducted in the Sci-Fi Hall of Fame in 2009. "I just think about things that seem eerie, or recall frightening situations from my own experiences then adapt them to the exigencies of illustration," admits Whelan. "I don't go for blood and gore; that's about creating revulsion, not fear. I'm inclined towards establishing a situation that provokes more of a feeling of unease than anything else. It's really very hard to actually create a sense of fear in an image alone. "We, as viewers, are so accustomed to hearing soundtracks with scary noises and music to trigger a 'fear' mood that to do it with an image alone seems almost impossible in these jaded times." Tete A Tete: Lipton describes this unnerving image as her "shadow"
"I do not love horror. I draw about the things that annoy or frighten me," explains artist Laurie Lipton. "When I visited Mexico after my mother died, I realised that I could grab onto my fear of death and feel an illusion of control by drawing about it." Of the image above, Family Reunion, the artist says: "Death will reunite us with our ancestors. This is how I imagined it will look." Godmachine is inspired by pop culture visions. "There was this video shop in my village when I was a kid, the only video shop for miles around. It was run by one of my older brother's friends and it was wall to wall awesome video cases of drawn, bad photo manipulations and terrible moustaches (a la Tom Selek)." "My inspiration came from a video shop in a small village (think Werewolf in London) crossed with the little curiosity shop in Gremlins where he buys the Mogwai and Royston Vasey... these fictional places created a great launching pad for me."